I'm having a hard time figuring out exactly what this is. 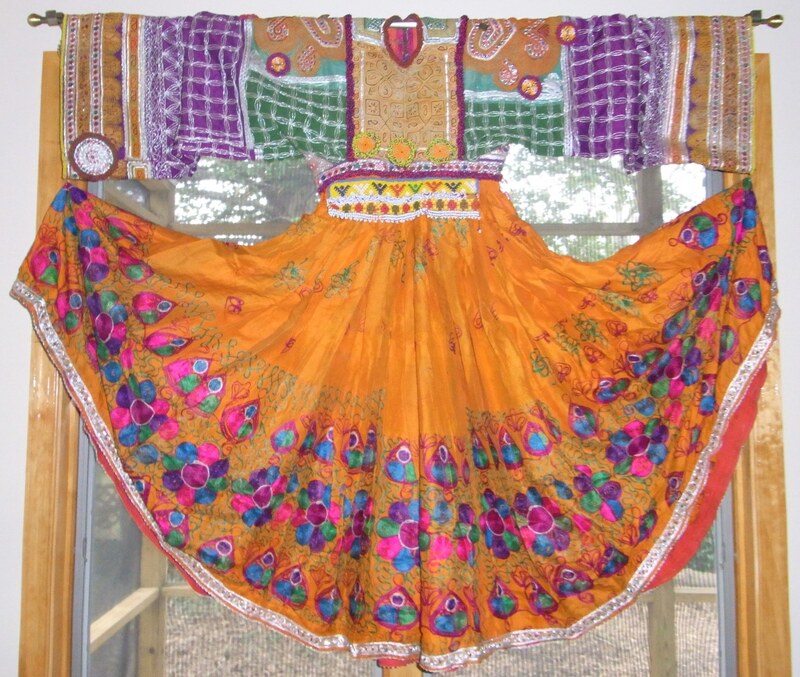 I suspect it's a wedding dress worn by women of the Kuchis people of Afghanistan. The Kuchis are Pashtun-speaking nomads, who heavily embroider their wedding dresses. And we've got one. The Roommate gave it to me for xmas a few years back. 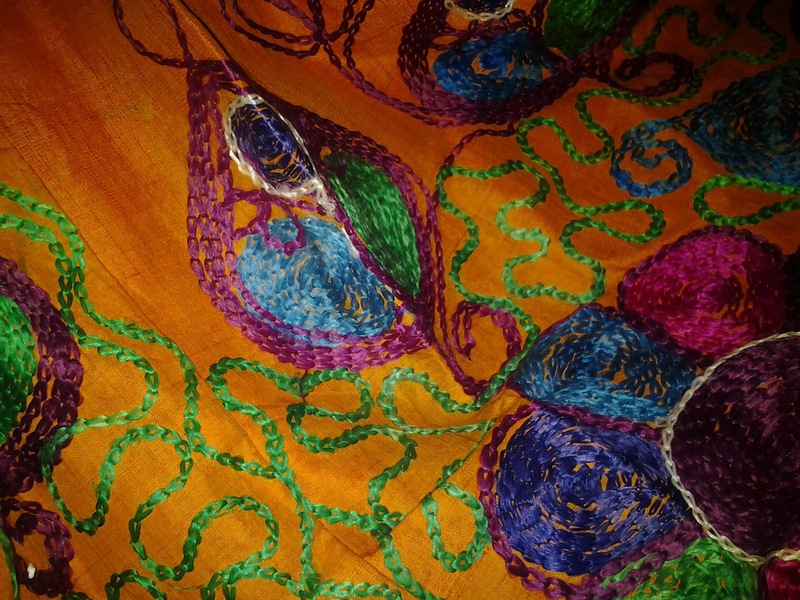 It was easy to get Afghan goods when we lived in Abu Dhabi. Unfortunately we never got to Afghanistan, so the souq in Abu Dhabi was the best we could do. I have been scouring the web for information about this type of garment, and would love to show you a photo of a bride wearing one. 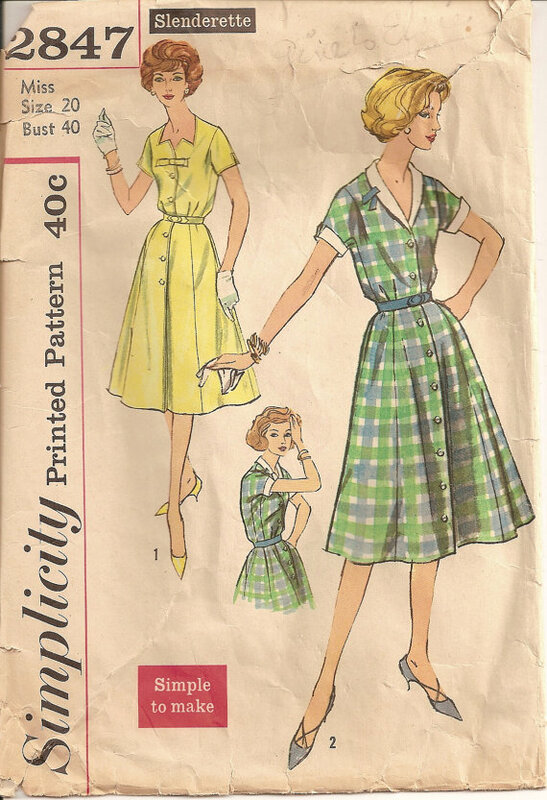 Though I have found plenty of dresses, modern & vintage that look similar, I'm finding very little about who would have worn these dresses, why and where. 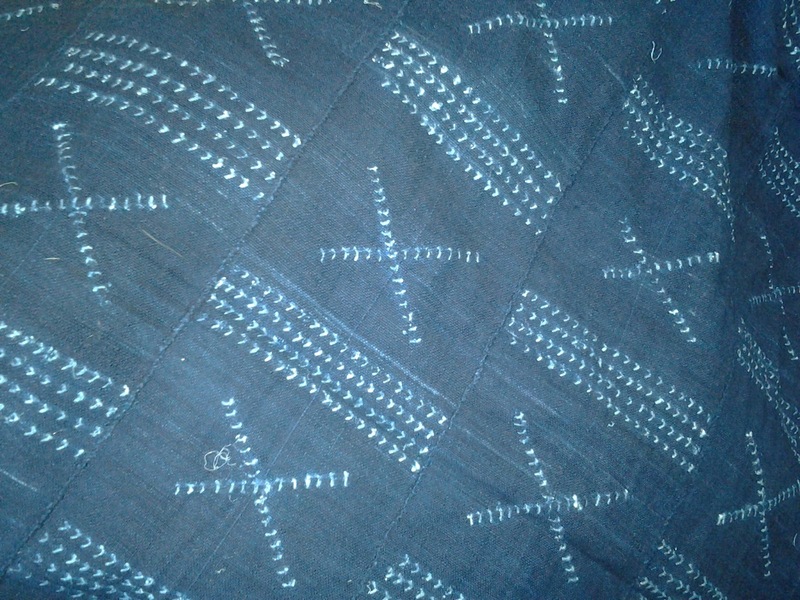 That they're worn by Kuchis women is about the closest I've gotten, and because weddings are a big deal the world over, I'm making an educated guess about the purpose of this garment. I feel sure that though this is a longer dress, it would probably be worn over a pair of loose pants. 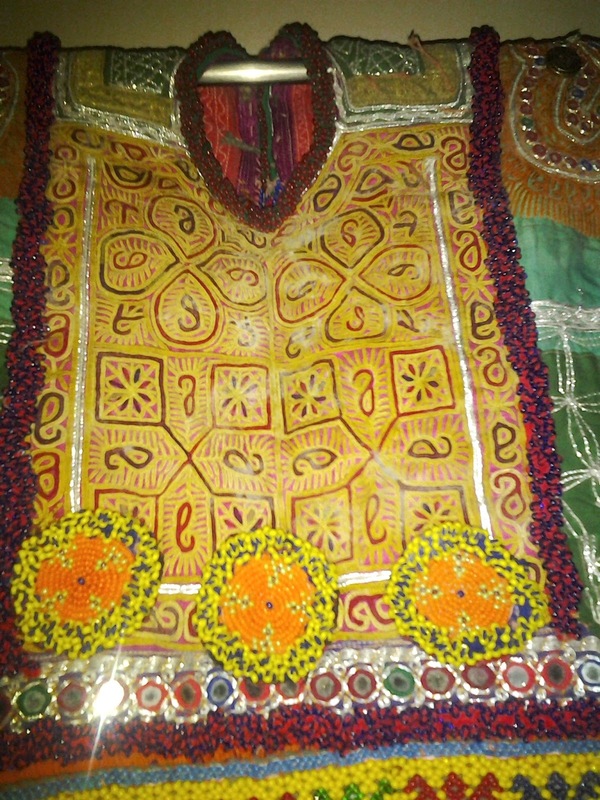 The top is heavily embroidered with glass beads and metallic thread. Round medallions of varying diameter are at the waist, the shoulders and on the sleeves. The sleeves have the finger loop (also beaded) that would go over the middle finger to keep the sleeves down. Although the dress itself doesn't seem that big (for an average sized woman), the sleeves are very long (and we had to fold them a bit to get them to fit on this 5' wide rod). This dress is heavy...the bodice is so thoroughly embroidered that it is stiff and the glass beads, mirror-work (shisha), and metallic thread bring it in at just over 9 lbs! 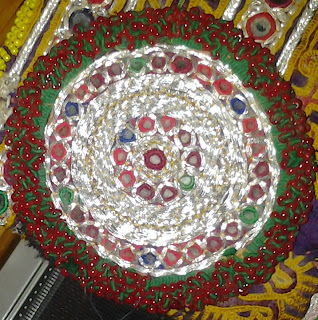 These are all common textile-decoration techniques from the NW of India, Pakistan & Afghanistan. Remember by common I don't mean simple! Just that they're from a time period where most women had amazing hand-work skills and plenty of hours to learn these skills & to show them off. If you're interested in a great book about textile techniques around the world (including many "how-to" instructions, such as adorning your latest creation with some mirrorwork), check out A Visual Guide to World Textiles by John Gillow & Bryan Sentance from Thames & Hudson. And one online store, Tribal Bazaar, has all sorts of amazing photos; I've never purchased from them, so don't know if they are reputable; but it's fun to look at their photos! The Roommate & I took many photos trying to get all the details showing to share with you. Enjoy! (Remember, clicking on a photo will take you to the full-size version of that photo.) Thanks for visiting & I'd love some comments if you know a bit more about this type of dress! I really love this pattern (you may remember it from my first post, as my Route 66 dress). 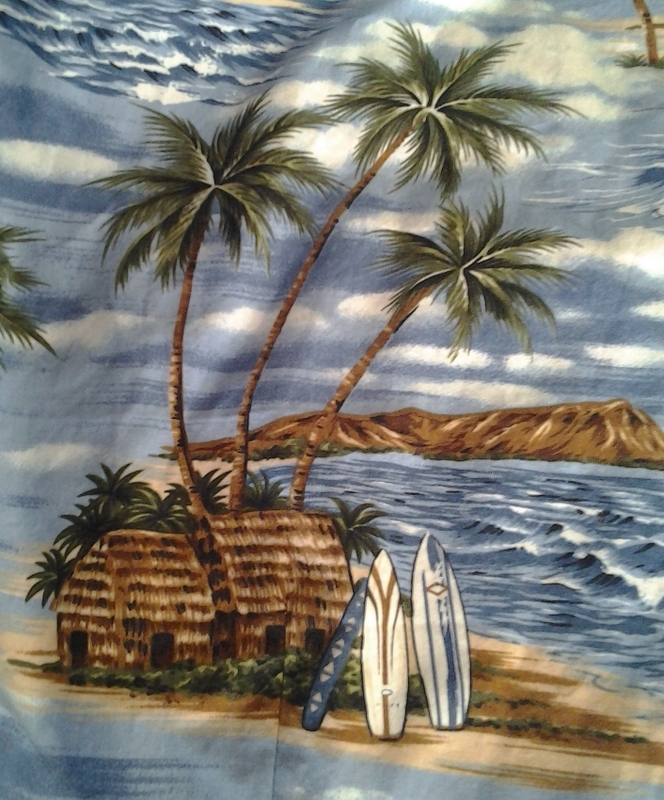 You may also remember that the Roommate has a large collection of what we call "fun shirts." 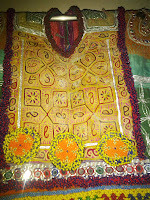 Which he had made by his tailor when we lived in Abu Dhabi. The fabric was so cheap & tailoring was so cheap that he has about 30 of them now. 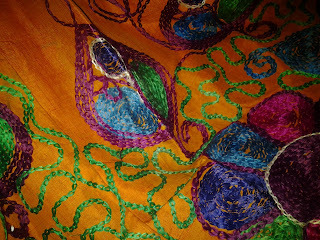 Well, I bought myself some fun fabric, while we were there & finally decided to turn it into a fun dress. 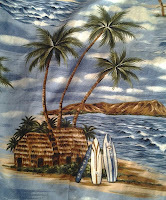 When he saw the fabric in my sewing room, the Roommate said, "Oh, am I getting another shirt?" No, dear, this one is for me! I'm lucky he doesn't hold a grudge! And I decided this is the time to learn about lining, too (I usually wear silk slips--also from my tailor, but they don't work so well for underarms). So last Friday I took another open studio class at Bits of Thread so that Allison could help me put in an off-white cotton-poly lining. Oh, regarding Zac Posen vs. Michael Kors as judges on Project Runway? Zac is great, but I miss Michael! What Do You Do While Sewing? Oh, and I'm Back! 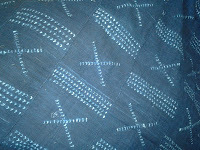 indigo tie-dye (adire) from Burkina Faso. Thanks to my follower in France for noticing I haven't been posting much (over a month according to her!). I haven't felt very inspired, family health issues have arisen and the Roommate & I are taking country swing dancing classes 2 nites/week...so it just seems like I don't have much time for blogging. Never fear: I do continue to have time for sewing! I thought I'd post about what I do while sewing and I'd be curious to know what you do, too! I am a huge Firefly & Serenity fan (SERENITY NOW! ), so I have seen the series & the movies many times. I started watching them with Spanish dubbing to improve my listening, so I've seen them many more times that way. I also listen to podcasts. Slate's Gabfest and Double X podcast, along with the Audio Book Club, the Culturefest and Lexicon Valley, all available on Slate's Podcast page. I also enjoy the Friday News Roundup (domestic & international) from Diane Rehm. I have a few TV shows I watch, rather irregularly, too: The Mindy Project and Parks & Rec. But the one I'm hooked on now is Project Runway; certainly appropriate. And PR is now in Season 11...and I've only seen a bit of Season 10 & 11, so I have plenty to catch up on. Which is good because I'm definitely not a speedy sewer & can't even begin to imagine how they complete some of those challenges in less than a day. So what about you? 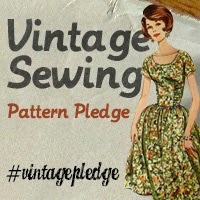 Are you completely focused while sewing and sound & video distract? Or do you have even more going on?